The landscape in front of the Vincent Price Art Museum is undergoing change and the project is set to finish at the end of April. The name of the project is East Los Angeles College Replace Water Intensive Landscaping Project. “We were able to get the project going with $800,000 of state funds and the intention of the project is to create a landscape that is more accessible to the public,” Abel Rodriguez, director of college facilities said. He said there is a lot of foot traffic in that area because of the public transportation that stops on that corner, and before the project started it was just a boring looking area with dirt and some trees. Rodriguez said that once it is done it will be a more welcoming space, and he thinks it will invite more people to visit the museum. The project also covers small areas on the side of the museum by the street as well as in front of P1 and on the side of P2. The architect of the project is Frank Villalobos, the President of Barrio Planners in East L.A., whose business that started in the early 70s and has done work throughout East L.A. and Boyle Heights. Rodriguez also mentioned that Villalobos was once an ELAC student. Rodriguez said the project started at the beginning of January and was supposed to be done by the third week of March, but the rain at the beginning of the year caused a setback for the construction workers. Rodriguez also said Magnolia trees that used to be in front of the VPAM have been moved around the campus partly because their intake of water is much greater than other surrounding trees in that area, meaning they need regular watering while the others don’t need as much attention. They compete for hydration causing some of the other trees to become weak and die. One area that some Magnolia trees were moved to is behind building K7 where it was previously just a bunch of dirt. 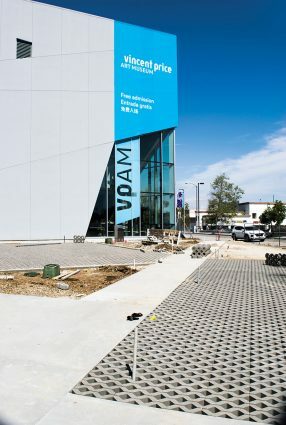 A couple of VPAM employees said that since the construction started, less people have been coming in because they think the museum is closed. “It’s kind of a good time since there’s only two exhibitions right now and more will be shown after spring break, but it has been slow and harder for people to come in since they have to walk around the fence by the sidewalk,” Kimberly Ruiz, one of the employees, said. Rodriguez said people can expect pathways to walk through in front of the VPAM, which are being created based on the dirt pathways people have made with their footprints. Once the project is completed Rodriguez still wants to continue to work on this area in front of the museum. Rodriguez envisions shaded areas in front of the museum for people to stand under so that they don’t have to stand by the trees for shade, as well as benches for people to sit. He also wants to have artificial turf on the side of P2 where students can sit or lie down and relax and read a book. Rodriguez said that although this probably won’t happen any time soon, these are his plans for the future.